You? Stop consuming? BAH! I drank with you, remember? You enjoyed those pints, my friend! Next time we'll bring Alex, Ged, and maybe even Neil! How appropriate for my 100th post. Edited by Singularity, 22 September 2004 - 11:30 PM. Hello everybody. My name is Hazmat and I'm an alcoholic. Maybe I'm just projecting. Last week, I tried giving up the sauce. Lasted five days. They were there in that pub that night...that satellite jukebox was cranking !!! They were? They were THERE? I know I was in the company of four charming gentlemen, but how did I miss that? You mean to tell me we dazzled you so much you didn't notice The Boys?? The pints, shots & the satellite Juke ROCKED!!! That's precisely what I'm saying! Four fine gents like you guys...a girl didn't stand a chance! Also VERY true...that was so much fun. I'll never forget it. Digital Man!!!! Great to see you, dude!!! Speaking of us four charming men, where's Soliloquy been? I liked Laphroaig also. Bought a bottle (15 year) for a friend's bachelor party. Nice and spicy! Nice stuff my friend! Thank you about the pics! Could you please explain which one of these is malt, blended,singe or pure malt e.t.c. ? This one is pure or single malt? 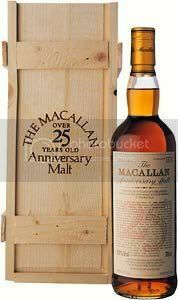 If it is 30year old then it must be malt! Still we don't now if it's malt or blended! If it is Elegancia then it must be "pure malt"!!!!!! I think that they are blended but I am not sure. I was under the impression they were all Single Malt.